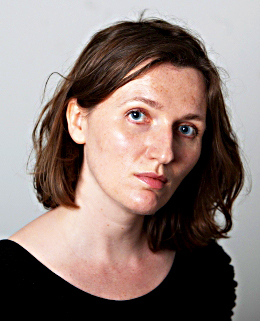 We begin today’s Weekly Roundup in the FT, with Claer Barrett, who was writing about financial advisors. To tie in with the publication of a list of the Top 100 IFAs, the FT had no fewer than five articles about advisors, which we’ll look at in turn. At times the content borders on advertorial – Netwealth in particular got a couple of useful plugs – but overall it’s worth a look. I should declare at the outset that I ‘m not a fan of IFAs. Their charges are too high and in general they know more about regulation than they do about investment. I would only use one when forced to by law (eg. on a pension transfer of more than £30K). Claer’s first article was entitled “Beware of fees“. 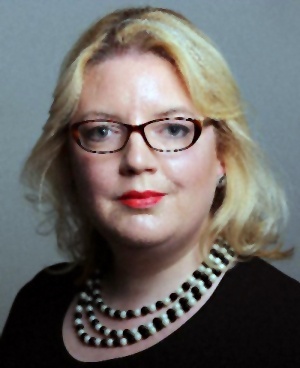 It was her response to reading 350 responses – mostly from investors, but more than 40 advisors contributed – to the FT’s online questionnaire (which I managed to miss). People were very unhappy about charges being based on a percentage of your assets, but that remains the dominant model (80% of fees are charged this way, according to a 2017 FCA study). Investors also didn’t like “restricted advice” where advisors can only recommend a certain set of products. Me neither – these people are salesmen, not advisors. A lot of investors were like me, and had taken the DIY route. They might want an IFA for specialist tax planning (usually IHT or pensions) but were often frustrated that they could not then find a fixed-fee adviser (which has been my experience, too). Advisors were not yet worried by robos, and perhaps they are right to feel that way – most investors said they wanted face to face advice. Claer’s second article was written with Nikou Asgari, and took the opposite tack – it was called “Spend more money“. 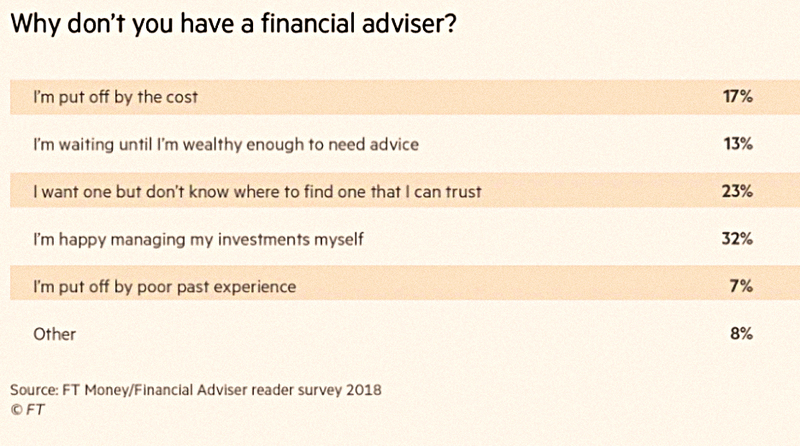 The survey asked advisors which piece of advice their clients were least likely to act on. They are also reluctant to pass on wealth while they are still alive (to save on IHT). Many clients also have no will and / or POA. The final area of disagreement was buy-to-let, which many investors still seeing this as a quicker route to riches than a pension. Nikou’s second article was about the questions that advisors are most often asked. I saw some research last year to the effect that only 8% of people pay for financial advice. There’s a fair spread of reasons why the minority (of these respondents) don’t have an IFA. Disturbingly, more than 60% of respondents chose their IFA based on a personal recommendation. There is no objective way to choose the person who will have the most influence over your finances. Just as disturbingly, 79% of clients are satisfied with their IFA’s charges. 13% aren’t, and 7% don’t know what they are being charged. My personal experience is that they are eye-wateringly expensive for the work they do – up there with estate agents and lawyers. I make that three for pensions, two for tax, two for planning and two for politics / macro. What should I do about Brexit? 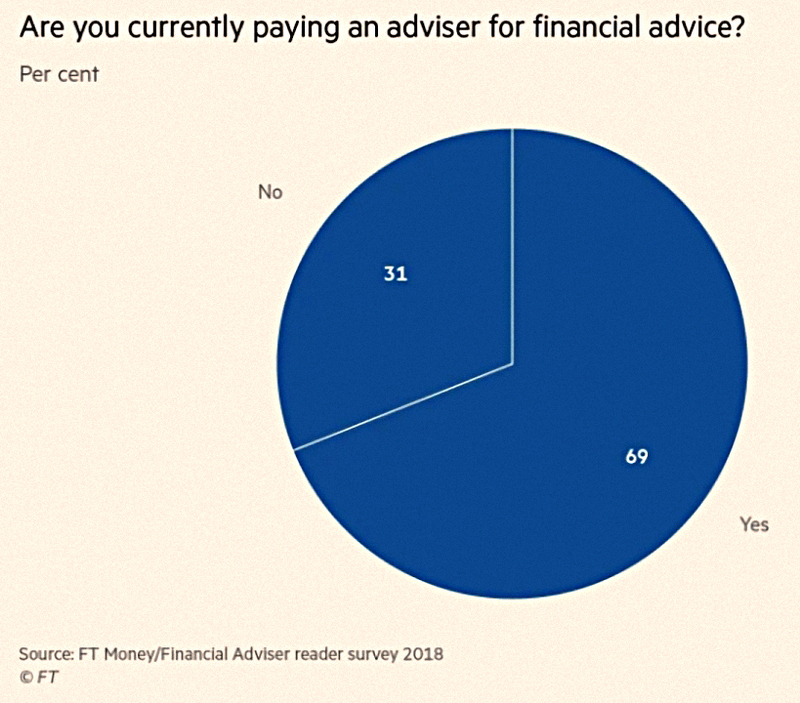 I think you can work all that out for yourself (perhaps with the help of a quality investment blog), but the FT line is that IFAs can be very helpful. I’m also surprised that FT readers are worried about Brexit, but never mention the threat of a Corbyn government, which would be much more significant. In real life, investors I meet have Corbyn as the number one issue, but there seems to be an omerta on the topic in the mainstream media. Nikou’s third article fleshed out Claer’s “three Ts” – it was about what investors want from an advisor. It sounds to me like they want a combination of a US-style fee-based fiduciary adviser and a financial coach. 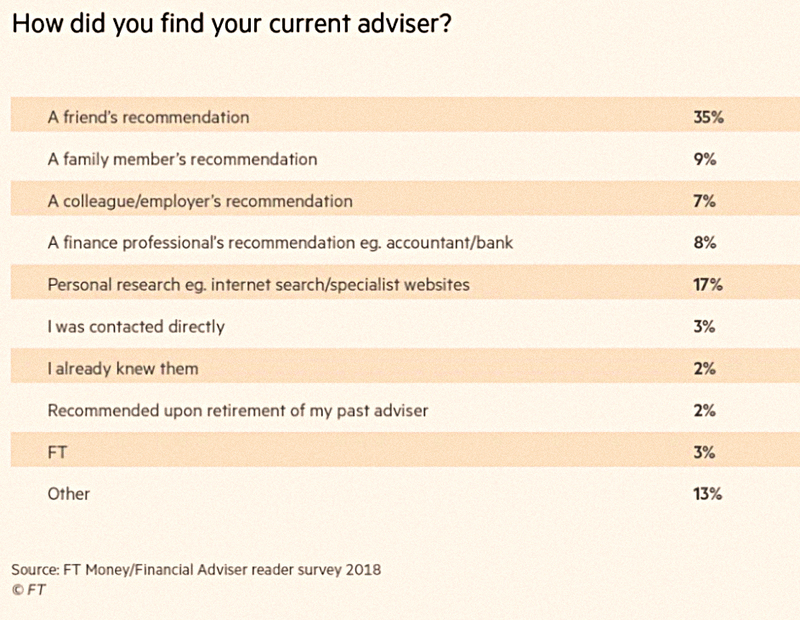 The FT also provided a list of the top 100 advisors, and for those who are interested, Emma Hughes gave an explanation of how the table was compiled. 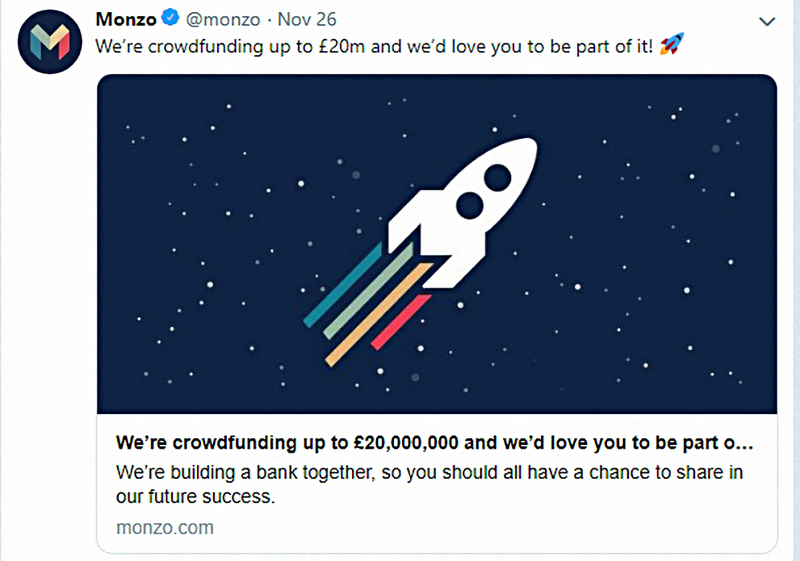 Monzo’s crowdfunding efforts came under attack when it emerged that they were allowing customers to subscribe for (unlisted, therefore unsaleable) shares using an overdraft. Monzo is raising another £20M on Crowdcube, where previous raises have sold out in minutes. Companies are banned from making loans to investors to buy their own shares, but the use of overdrafts does not appear to be covered by the rules. Monzo has approval from the Prudential Regulation Authority for the capital raising and its prospectus has been approved by the UK Listing Authority. Monzo emphasises on its blog how its share price has risen from £2.36 to £7.71 in 11 months, despite it having no bearing on future performance, adding that it doesn’t want customers “to miss out”. 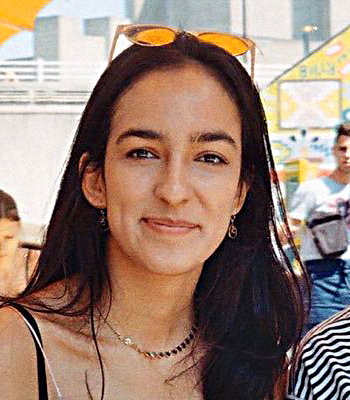 The accusations provoked a cult-like defence from Monzo’s customers, both in the comments section of the Times and on the Monzo bulletin board. We are committed to lending responsibly, so we only offer overdrafts to people who have a good credit history and can afford the repayments. We’ve made people aware of the risks that come with crowdfunding. Before investing, customers need to pass a regulated test to make sure they understand the investment — and anyone who doesn’t pass can’t invest. I think that test is self-assessed, however. We don’t encourage our customers to borrow money, from Monzo or anyone else, to buy shares. We offer overdrafts to our customers and aren’t withdrawing that facility while fundraising is live. We’ve made it clear that investments like this are risky and illiquid, meaning that anyone who invests will probably need to hold their shares for at least a few years. We also don’t believe it’s our place to judge or restrict how people spend their money. We think individual freedom trumps the risk. Should you ban people from using overdrafts when they go to the pub? I’m not sure I would start with the pub, but I’d like to see tighter controls on consumer credit in general. I don’t understand why people like Monzo so much – every service they offer seems to be matched or bettered by another startup fintech. Despite this, they are the fastest-growing bank in the UK (in terms of current accounts, of which they have 1.2M, growing at more than 100k per month), and are top of the Which? table for customer service. So perhaps they might turn out to be a good investment (even if only because they will get taken over by a “real” financial institution). At the moment though, Monzo is heavily loss-making (£33M in the year to February 2018), has modest revenues (£2M),a sky-high valuation (more than $1 bn) and several decent competitors (a couple of which I use – Tandem and Starling). Borrowing money is never a good idea – unless it’s in order to buy a house, which (i) satisfies a long-term consumption need in a tax-efficient way and (ii) has a decent chance of appreciating in price along with wages / inflation. Crowdfunding is extremely risky – nine out of ten startups will go bust – and is unsuitable for all but a very small set of investors (people who have maxed out their pensions and can’t get hold of enough quality VCTs for income tax relief). A lot of the name-calling seems to revolve around whether Monzo are encouraging their fans to borrow to buy their shares. I can’t find any evidence of that, but they are allowing them to do it. The reference to the previous rise in share price does seem designed to create FOMO. And they have been sending out tweets featuring rockets, which is quite spivvy. I won’t be subscribing because I’m not an existing customer, but I shall watch Monzo’s development with interest. 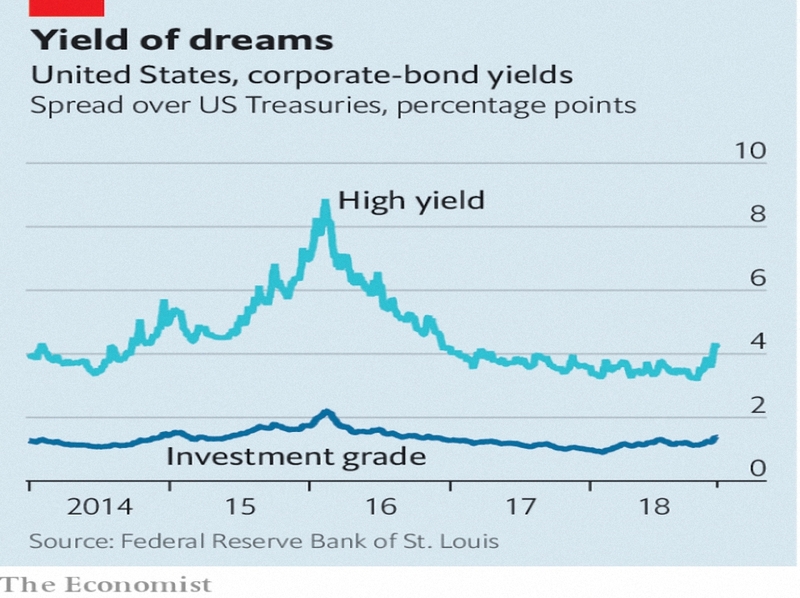 In the Economist, Buttonwood looked at why corporate bonds are usually a bad investment at the end of the business cycle. He begins by reminding us how Michael Milken rehabilitated the junk bond (“fallen angel”) sector in the 1980s, before turning to insider trading (and later reforming). The lack of a taboo against investing in junk means that they are no longer the bargains they once were. The best returns in corporate bonds are at the start of the cycle, when default rates are still high and they are unloved. During the cycle, the spread over risk-free Treasuries narrows. Late in the cycle, bonds are issued to fund projects that will turn out to be dodgy. And as interest rates rise, firms with the highest debts suffer the most. This time around there are a lot of bonds in issue, and lost more at lower investment grades. There are also a lot of risky leveraged buyout loans. Musings on Markets looked for closure with Apple and Amazon. The Economist reported on bitcoin losing most of its value this year. Flirting with Models examined whether maximising diversification was the best strategy. And the FT reported on the retail risk spooking property investors. We begin today's Weekly Roundup in the FT, with Jason Butler, who was writing about financial fitness.